The Eastside Tigers Bantam A2 team, after winning the CSHL playoff and championship titles on March 2. 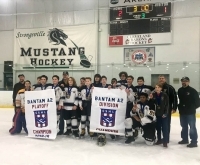 The Eastside Tigers Bantam A2 hockey team clinched the 2019 Cleveland Suburban Hockey League (CSHL) Division and Championship titles on Saturday, March 2, at Strongsville‘s OBM Arena. The team comprises 14 players, all ages 13–14: Evan Bleick, Jonathan Cheshier, Thomas Cheshier, Jaden Cosgrove, Andrew English, Will Garceau, Ben Hidek, Justice Ikehara, Brendan Lang, Niko Rios, Claes Roulet, Alex Rzepka, Lanell Sotiropoulos and Henry Turner. 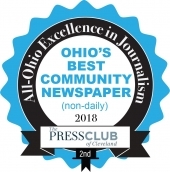 Among them are residents of Cleveland Heights and University Heights, including six players who attend Roxboro Middle School. 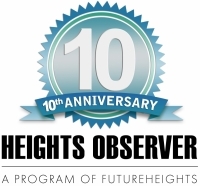 Several of the players plan to play on the Heights High hockey team next season, as freshmen. In the semifinal game, which took place the weekend before the final, Bleick scored on a pass from Lang to beat Strongsville in double overtime, advancing the Tigers to the final against Mentor—the only team to beat the Tigers in the regular season. The Tigers were down 0-1 in the championship game until Sotiropoulos scored at the buzzer to tie the game at the end of the second period. Sotiropoulos then scored the game-winning goal with 3:39 minutes left in the third period. Solid defense by Thomas Cheshier, Lang and Turner kept the Tigers ahead, despite an offensive onslaught by Mentor after that team pulled its goalie. Jonathan Cheshier sustained a concussion at the Rock & Roll Cup tournament in February that knocked him out of post-season play, but he put in great work between the pipes to enable the Tigers to win the division and qualify for the playoffs. The team’s coaches are Carl Bleick, Jason Hidek and Mark Turner. Will Cheshier serves as team manager. Cleveland Heights residents Jennifer A. Lang and Andrea C. Turner are proud parents of Eastside Tigers hockey players.